The response of agricultural holdings to the agricultural policy supporting the spreading of organic farming has been growing every year. 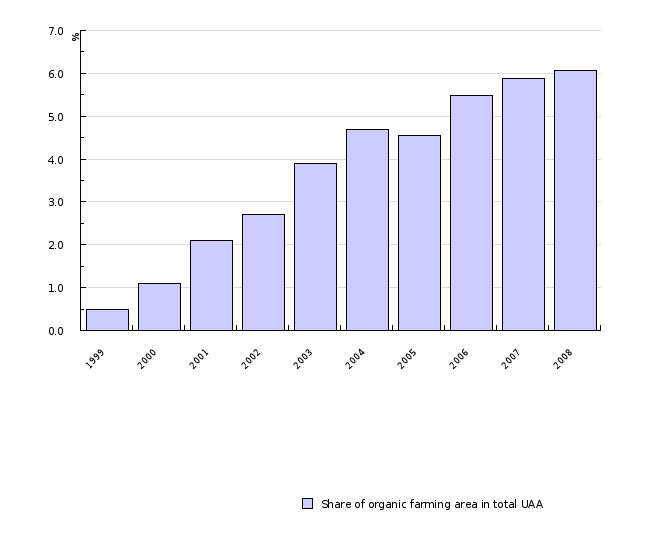 The area intended for organic farming have increased in the period 1999-2008 from 2,400 ha to 29,836 ha, or from 0.5 % to 6.1 % of all utilised agricultural area. The indicator shows area included in organic farming and its share in the total utilised agricultural area in Slovenia in the period 1999-2008, and in the European Union (EU) in 2007. It covers all the area included in the control of organic farming, i.e. those where organic farming has already been carried out, and those in conversion to organic farming. The indicator does not provide direct information on the environmental efficiency of the measure, but points to the response of agricultural holdings to the agricultural policy supporting such production. Ministry of Agriculture, Forestry and Food of the Republic of Slovenia, 2009; Statistical Office of the Republic of Slovenia, 2009. Organic farming is a special form of sustainable management of natural resources in line with the principles of raising the quality of food, reducing environmental pollution and preserving biodiversity. The use of synthetic plant protection products and easily soluble mineral fertilisers, growth regulators and hormones, genetically modified organisms etc. is not allowed on area intended for organic farming. In Slovenia, organic farming started to spread in the late 1990-ies, and in 1999 farmers had the possibility to claim support for this type of production for the first time. Until 2001, this sphere was regulated by Recommendations for organic farming (MAFF), or guidelines of ecological societies and associations. Since 2001, organic farming has been governed by the Rules on organic production and processing which comply with the European Regulation on organic type of farming. In 2001, support to organic farming was included in the Slovenian agri-environmental programme, and after the EU accession in 2004, it became part of the Rural Development Programme of the Republic of Slovenia. In 1999, the control of organic farming included 2,400 ha or 0.5 % of all utilised agricultural area. By 2008, organic farming was extended to 29,836 ha or 6.1 % of all utilised agricultural area. The structure of agricultural land with organic farming is still strongly dominated by grassland (88% in 2008), which shows that the transition to this type of production was primarily animal holdings decided for. Organic farming has been spreading in the EU as well. In 2007, the EU-15 countries ran organic farming (or the areas were in convertion to it) on 4.7% of the total utilised agricultural area (3.0% in 2000). The highest share of organic farming is in Austria (11.7% in 2007), Sweden (9.9%) and Italy (9.0%), while among the new Member States the leading ones are Latvia (9.8%), Estonia (8.8%), and the Czech Republic (8.3%). By the share of agricultural land with organic farming, Slovenia ranks somewhere in the medium of EU-27. Objectives summarized by:the Rural Development Programme of the Republic of Slovenia for the period 2007-2013, and the Action Plan of Organic Farming Development in Slovenia until 2015 (APOFD). Source database or source: Data on the number of farm holdings and the area subject to organic farming control are collected by the Ministry of Agriculture, Forestry and Food (MAFF). They are published on a href="/en/%3Ca%20href%3D"http://www.mkgp.gov.si/en/">http://www.mkgp.gov.si/en/">their website (Areas of Work > Agriculture). - Environment and natural resources > Agriculture and Fishing > Plant Production > Produce and surfaces > Groups of land categories and crops (ha). - Environment and natural resources > Agriculture and Fishing > Organic farming > Land use by type of farming (ha). Methodology and frequency of data collection for the indicator: Data on the inclusion in organic farming are supplied by organisations authorised for control and certification. Data include area for which the farm holdings have already obtained the certificate, and the area in conversion to organic farming in the transitional period before obtaining the certificate. Data are published every year and are available from 1999 on. Data processing methodology: Data on area under organic farming are used directly, and the relative indicator is calculated by dividing this area with the total utilised agricultural area (area under organic farming /UAA x 100). - Advantages and disadvantages of the indicator: the advantage of the indicator is in its regular publication within SORS. Reporting is governed by rules and is uniform for the entire EU. 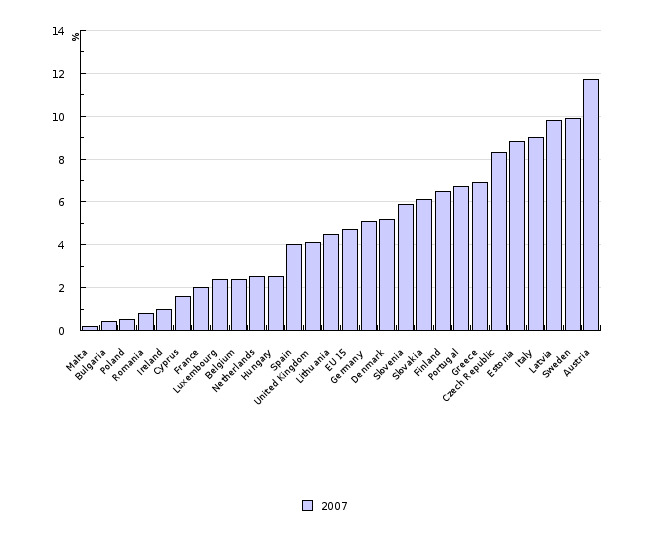 Source database or source: Data on the share of utilised agricultural area included in organic farming by individual Member States are available in EUROSTAT databases (Statistics Database > Statistics > Main tables > Agriculture, forestry and fisheries > Agriculture > Organic farming > Area under organic farming (%)). Methodology and frequency of data collection for the indicator: DData refer to area included in the organic farming control. Data are provided by Member States once in a year. Data processing methodology: Data are used directly. Geographical coverage: EU-15 is composed by old Member States: Austria, Belgium, Denmark, Finland, France, Greece, Ireland, Italy, Luxembourg, Germany, Netherlands, Portugal, Spain, Sweden, United Kingdom. - Advantages and disadvantages of the indicator: the advantage of the indicator is in its regular publication within EUROSTAT. Reporting is governed by rules and is uniform for the entire EU.